Many Stanford University student groups and leaders have spoken out against an event this Tuesday featuring Robert Spencer, who they say promotes ideas that "demonize Islam" and "motivate hatred toward Muslims." Weekly file photo. A Stanford University student group's hosting of a provocative speaker, an author who believes Islam justifies violence and terrorism, has sparked controversy over the limits of free speech on campus. The Stanford College Republicans have invited Robert Spencer, author of the "Jihad Watch" blog, to speak at the group's flagship event of the year on Tuesday night. Spencer's blog is "dedicated to bringing public attention to the role that jihad theology and ideology play in the modern world and to correcting popular misconceptions about the role of jihad and religion in modern-day conflicts." Spencer is also the co-founder of Stop Islamization of America and the American Freedom Defense Initiative. While the College Republicans describe him as eminently qualified to speak about radical Islamic terrorism and international security, Spencer's work and qualifications are not without controversy. The Southern Poverty Law Center deems Spencer one of the country's "most prolific and vociferous anti-Muslim propagandists" and classifies the two organizations he co-founded as hate groups. His upcoming talk at Stanford has ignited debate about tolerance and speech rights at a university whose founding motto is "The wind of freedom blows." The College Republicans, who did not respond to multiple interview requests, recently defended their decision to invite Spencer in a piece published in the Stanford Review. They said they hope to challenge the "conventional wisdom" about Islam on college campuses and "ignite a spirited discussion" about a pressing issue. "Mr. Spencer’s central assertion is that jihadist groups are inspired to commit acts of violence against unbelievers by passages in the Quran and Hadiths that exhort believers to do so," the group wrote. "We have invited Robert Spencer to campus to add a sorely needed perspective to an important conversation about international security." Opposition to Spencer's visit by students has been swift. Twenty student groups joined together to pen an open letter demanding the College Republicans cancel the event. Two Stanford Law School groups, the Muslim Law Students Association and Stanford Advocates for Immigrants' Rights also wrote an op-ed published in the Stanford Daily Monday, "College Republicans promote hate and disinformation." The undergraduate and graduate student senates formally condemned the event, which is not open to the public. The open letter, signed by groups including the Arab Students Association at Stanford, the Muslim and Black student unions and the Stanford Democrats, argues that "Spencer's arguments demonize Islam and perpetuate fear-mongering against Muslims, including Stanford's own Muslim community and others vulnerable to Islamophobia. 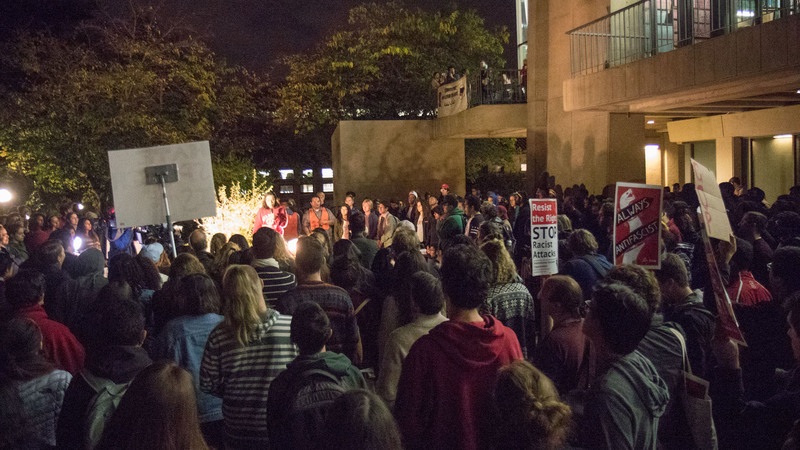 "The decision to host this event does not establish Stanford as a campus where free speech reigns but one where hate speech is given a microphone," they wrote. The coalition, dubbed Stanford Against Islamophobia, has organized a rally during Spencer's talk, which the organizers hope will provide an alternative place for people to express their views. "We're asking the campus to boycott the event so as to not legitimize (Spencer's) presence or engage with him," said Ramah Awad, a Palestinian Stanford student and Stanford Against Islamophobia member. In a blog post last week, President Marc Tessier-Lavigne and Provost Persis Drell wrote, "The free expression of ideas is absolutely central to the academic life of the university. At the same time, we recognize and worry about the fear or hurt that many individuals experience based on rhetoric in our country or interactions they have in our own community." The university has said it supports the College Republicans' right to invite an outside speaker to campus and for others to protest peacefully, as long as university policies are followed. If a speaker "espouses views that are at odds with the fundamental values of the university, the university leadership will not hesitate to speak out against those ideas, even as we allow them to be voiced," Tessier-Lavigne and Drell wrote. In a separate blog post, Vice Provost for Student Affairs Susie Brubaker-Cole and Dean for Religious Life Jane Shaw said that Spencer's "track record of actions and speech that motivate hatred towards Muslims ... contradict(s) our university's values of inclusion and respect for all peoples and faiths." Awad said she's not satisfied with how the Stanford administration has responded. "We have made a strong case for why Robert Spencer is not the person to bring on issues relating to Islam or issues relating to foreign policy," she said. "I don't think they're respecting their own academic integrity by allowing this event, and they're not regarding Muslim students on campus (and) people of color on campus." Funding for the event has also sparked some controversy. The College Republicans is paying for the "bulk" of costs with funding from Stanford's student-government body, the Associated Students of Stanford University, but the university is also providing funds through "a program that provides a partial subsidy for events requiring security," a university Q&A states. University spokeswoman Lisa Lapin declined to state how much money or what kind of security Stanford has provided, citing "security reasons." A petition opposing the use of student fees for a speaker who is "actively hostile to a large segment of our campus community" has gathered hundreds of signatures. The university plans to make staff available both at and immediately after the event to "support" students. In the Stanford Review piece, the College Republicans said it "reject(s) all attempts to curtail freedom of speech on this campus" and expects the same "fair" treatment its members have given other student political groups who hosted speakers with whom they disagreed. "We also expect that Stanford will live up to its reputation as an intellectually challenging institution open to a free exchange of ideas," the group wrote. I've never heard of this person. However, I would emphasize that disagreement with something isn't the same as a "phobia" of it or a ridiculously contrived assumption that it amounts to "hate" speech. Wouldn't it be nice if people could debate the words that he speaks rather than the finger-pointing or hysteria of the moment? A college is supposed to be a place that challenges us and provokes us toward reflecting on our beliefs and norms. It was never supposed to be a mental "safe space" where people are deathly afraid of being offended. Universities should promote freedom of speech. If the speech contains targeted religion, they have no place at a university. Free speech, as long as there is no advocating violence, means that occasionally somebody will say something you don't agree with. You don't have to listen so you can stay away, that is your free choice. At the same time, something you say may not agree with the opinion that others have, but you would want to be listened to respectfully or those disagreeing with you to stay away too. Free speech means more than one opinion. Debate doesn't get you anywhere with somebody who is trying to inspire his followers to commit violent acts, even while staying within the law by not advocating some *particular* act. All it does is legitimize it. The outcome is that people who outcome is that people who are mentally a bit unstable take it seriously, and feel that they have community approval to commit violent acts. A more useful response to demonstrate community rejection of his hate. This makes it clear to any third parties who might be listening that he is completely unsupported by the rest of us. He has no place at our great American universities. Hate has no place at Stanford. The college republicans are just throwing this out there to make headlines. Makes one realize how lost they have become. Are they still supporting Roy Moore over there? Any one who supports a fascist like Geert Wilders does not deserve a platform. Spencer: “I support Geert Wilders"
The worst part of this is when people who have never listened to or read someone's writings or words jump on a hysteria-infused bandwagon and declare such individuals as "fascists," "hatemongers," "bigots," "-phobes," or even "communists." A few years ago, Dan Savage (of the "It Gets Better" campaign) visited a campus where one of my siblings was attending college. Dan Savage has a long history of anti-Christian and anti-Conservative bigotry. He mocked Christians and the Bible at high school assemblies. The man called for the dragging death of a Democratic Party gubernatorial candidate in Pennsylvania and boasted that he tried to infect a Republican Party congressional candidate with influenza (by wiping mucus on the phones at their campaign headquarters). As much as I truly loathe individuals like Dan Savage, I would never try to prevent the guy from speaking at a university and speaking to people who want to listen to him. In this case, I haven't found this incoming speaker of espousing violence (like Dan Savage did). I certainly haven't found him spewing overt hate speech at anyone either. I certainly don't agree with the ridiculous claim from the Stanford Daily op-ed that the Stanford's "College Republicans promote hate and disinformation" (a headline that truly is cringe-worthy in its attempt to arouse hate and hysteria). As is too often the case, the people who shout the loudest are upset simply because they disagree with his opinions. Let the man speak. If he says something wrong, then point it out. Don't resort to name-calling and stifling free speech. "Let the man speak. If he says something wrong, then point it out." He has spoken. And since he espouses things like: “it is entirely reasonable for free people to oppose the construction of new mosques in non-Muslim countries” (May 2, 2010) it is entirely reasonable to tell him to go away. Far away. "an author who believes Islam justifies violence and terrorism..."
Where's the "controversial" part? Reformist muslims all over the world, from Al Sisi to Stanford's own Ayan Hirsi Ali, acknowledge that Islam has some serious problems in its violent founding text. We would be doing them no favors by assisting in the radical muslims' efforts to suppress all discussion of it. I've heard an interview with Spencer and his views don't hold up with even a cursory understanding of history. Let him speak so his inanity is exposed for all. But restrict the audience to people with Stanford IDs so the nutcases on both sides don't fight it out. @Aninymous...I assure you that there will be plenty [portion removed] with Stanford I.D. that show up, the majority being those that want to suppress free speech because it makes them uncomfortable to hear opinions they don't agree with. @HowYouPray......"somebody who is trying to inspire his followers to commit violent acts," is part of the speaker's discussion of the Koran call to violence at any costs. I agree that the mentally unstable Muslim followers of the literal meaning of these words make attempts to legitimize their violence, but can't. It would be admirable if more peace loving Muslims spoke out against the perversion of their Holy Book, but the reality is that very few do, possibly out of fear for their lives. "I assure you that there will be plenty [portion removed] with Stanford I.D. that show up, the majority being those that want to suppress free speech because it makes them uncomfortable to hear opinions they don't agree with." So they're going to the event to make themselves uncomfortable to hear opinions they don't agree with? Hmmm? Sorry, but the attitudes you project onto the majority of attendees don't make sense. I shouldn't be surprised, and I'm not. A couple hundred students stood in line to get tickets for the Spencer talk. They waited for him to start speaking, and walked out, leaving him to speak to a near-empty hall. They joined a group of a few hundred more standing outside the Mitchell Earth Sciences building. More protesters showed up than could fit on the terrace. Despite a crappy sound system, people stayed at the protest for hours to hear talks about how Spencer's kind of hate is destructive. Overall, protesters outnumbered haters by 20:1 or more. At the end around 10pm, the protest organizers took pains to prevent haters and protesters from coming into contact, so that the haters wouldn't have a chance to start a violent incident.